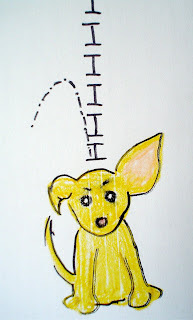 My sister had a dream many, many years ago (before I became Christian) about our dearly departed Chihuahua Yoda. She dreamt that Yoda was sitting neatly as she always did, and that she had a series of capital letter "I"s rising in an inifinite vetical line from her tiny domed head. Integrated in the vertice were little letter "i"s, which at a midpoint faltered off into a downward curve, with only the capital "I"s continuing straight up. I forget why the dream was about or directed to, me, but it was. I will have to ask her to remind me. Obviously the metaphor here is the Christian concept of acquiescing to God, capital "I," and allowing your ego, little "i" to fall out. This has been my greatest struggle as I am severely proud and stubborn in unexpected ways. The image has never left my mind in over a decade. When I later read the bible and found out that Yodh is the smallest letter in the Hebrew alphabet I got a kick out of that. How appropriate for my little eggshell-headed chihuahua.